The second edition of ‘Art for a cause’ took place at St. Paul and St. Peter’s Primary School, Ebutte Metta on October 6, 2016. The initiative, a brain child of Socially Africa is a community development project set up to inspire and educate the younger generations using Art as a medium. 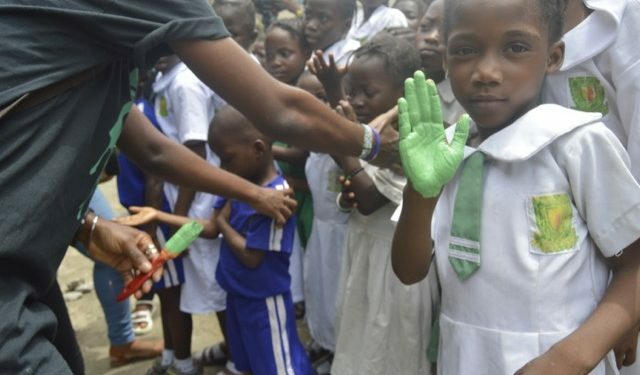 The children were involved in the process of beautifying their schools in a move that was not only for its artistic appeal but also for knowledge, showing one of the means that children can get to learn even outside the classroom. The excitement of the children was very visible as they participated in different educational games, nursery rhymes and palm inscribed painting on their school wall. The organizers, Socially Africa also gave out educational gift packs that contained art inspired items such as coloured pencils and crayons. Individuals from different walks of life came to support this cause including foremost blogger Olorisupergal, Public Relations Consultant Nike Fagbule, Photographer Shola Animashaun and creative minds Adaora Mbelu Dania and Akinlabi Akinbulumo. The children could not contain their joy as they showed much excitement through the paintings and the opportunity to learn more while giving them the access to another means of knowledge acquisition which they are not used to. Art for a cause seeks to create more awareness on the need to have Art as a communication tool among children and the initiative calls for donors and volunteers.